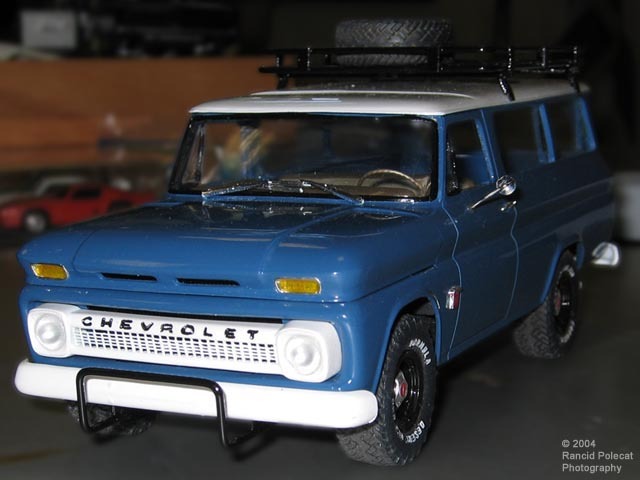 Charlie started with an R&R Vacuumcraft transkit and a Revell 1964 Chevrolet pickup truck kit. He ground out the grille from the backside to open it up, which added lots of dimension to the front end. For the body, he used a Testors Model Master military flat color mixed with an equal amount of Testors Clear Gloss. Charlie cut that mixture 50/50 with Testors airbrush thinner before he sprayed it on. On the roof, he used Testors Classic White, again cut 50/50 with Testors airbrush thinner.